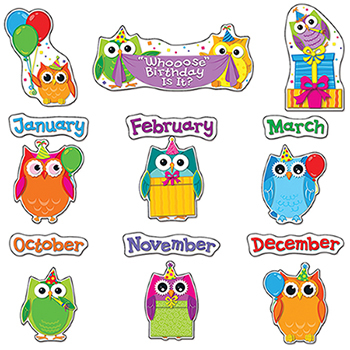 Celebrate students' special days with this adorable, contemporary Colorful Owls Birthday Bulletin Board Set. Includes 27 pieces: "?Whooose' Birthday Is It?" header , 12 birthday owls ,12 months and 2 owl accents.